At 8:00 pm in the Parish of Santa Teresa, Tribute to the Virgen de los Dolores. At 5:30 pm, Representation of the Passion in the Classroom of Culture, with the children of First Communion. At 9:00 am, Holy Mass in the Parish of Santa Teresa. At 10:30 am, Holy Mass in the Parish of Santa Teresa. At 11:30 am, Holy Mass in the Hermitage de Ntra. Sra. Del Carmen. At 12:00 pm, Blessing of branches of the Town Hall Square (Plaza del Ayuntamiento) and processions. At 12:30 pm, solemn Mass in the Parish of Santa Teresa. At 8:30 pm, Community Celebration of Penance in the Parish of Santa Teresa. At 5:00 pm, Holy Mass in the Ermita de Ntra. Sra. Del Carmen. At 6:00 pm, Celebration of the Lord's Supper in the Parish of Santa Teresa. At 10:00 pm, Holy Hour in the Parish of Santa Teresa. 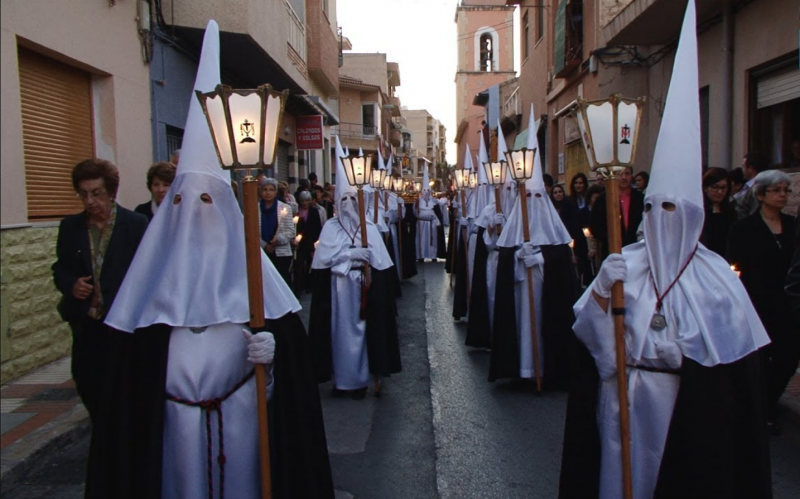 At 11:00 pm, Procession of Silence, through the old town. At 08:00 am, Holy rosary and Via. Crucis in the Hermitage de Ntra. Sra. Del Carmen. At 5:00 pm, Trades of the Passion and Death of the Lord, Parish Santa Teresa. At 8:30 pm, Proccesion to the holy burial, through the old town. At 10:00 pm, Easter Vigil in the Parish of Santa Teresa. At 11:00 pm, Solemn Easter Vigil in the Hermitage Ntra. Sra. Del Carmen. At 10:30 am and 12:30 pm, Holy Mass in the Parish of Santa Teresa. At 11:30 am, Holy Mass in the Hermitage of Ntra. Sra. Del Carmen. At 7:30 pm, Holy Mass in the Ermta de Ntra. Sra. Del Carmen. At 9:00 am, Mass in the Parish of Santa Teresa. At 9:00 am, Procession and then Holy Mass in the Parish of Santa Teresa.